The Hyundai Veloster's some strange hybrid of an Aston One-77, Saturn's unlamented three-door SC2 and the beloved Honda CRX. Who'd have thought such a combination was even possible, let alone be a recipe for the most compelling economy car in a largely uninspiring market. Full Disclosure: Hyundai wanted us to drive the 2012 Veloster so badly that they flew us to Portland, put us up, bought us dinner, got us into three nights' worth of shows at the Doug Fir, fed us too many donuts, took us to a Ducks/Wolf Pack football game, had food trucks come to our hotel and treated us to a buffet at a brewery. Oh! And lunch in Hood River at some place that had really excellent lemonade, but few vegetarian options save for bread and salad. A decade ago, Lamborghini was pulling the wraps of the Murcielago. A leggy blonde and I were a few months away from choosing Ted Leo's "Biomusicology" as the march for a wedding that never came. And people who drove Hyundais were generally considered frugal and tasteless. Back to the intro statement. Well, it's certainly not an Aston — no real scrutiny is required to determine that the Veloster's jowl vents are non-functional. The solidity of the the build and attention to detail are a far cry from anything produced by a GM in the throes of its passenger-car badness. So a modern-day CRX then? The bi-level rear window suggests it, as does the fastback profile. But if the CRX was a sensible, workaday front-wheel-drive two-seat sports car, the Veloster's more of an econo grand tourer. What's interesting is that this FWD GT actually weighs in at 80 lbs less than today's sports-hatch standard-bearer, the Mini Cooper S. Don't, however, expect Mini-like directness or zippy drama. 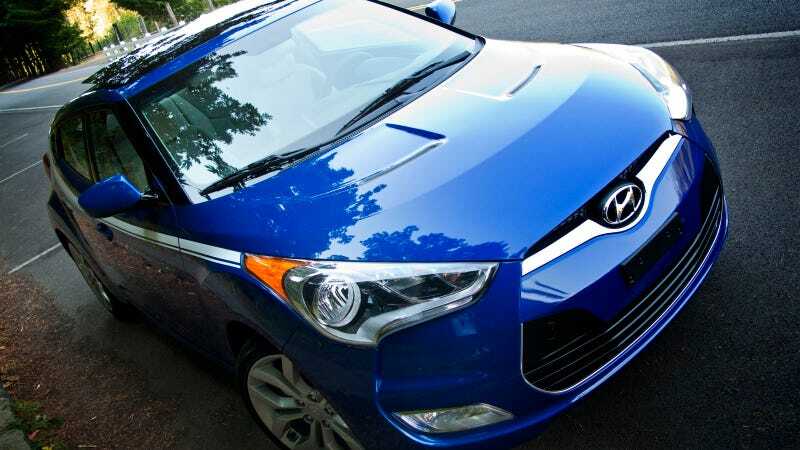 The Veloster delivers in a very relaxed fashion, with a disconnectedness that brings to mind a game console. The clutch and steering are devoid of any sense of connected feel; the shifter's action has a slight oddness to it which takes a few minutes to adjust to, and the throttle mapping seems slow to accept inputs. At first, it's all a bit disorienting, like everything's there, it just works a little differently than you'd expect. The Columbia River Gorge's geology gives rise to some fantastic roads, where the Veloster's controls actually start to make sense. The chassis, which seems firmly planted at all times — despite the Veloster's relatively light weight — carries itself through corners with a remarkable neutrality. It doesn't feel like a front-driver, per se. Nor does it feel like a rear-drive or AWD car; it's almost as if the power's being delivered via a centrally-mounted wheel under the center stack. If the steering isn't engaging, it's at least accurate. The ABS might engage a bit early for my taste, but it's never disruptive to the action at hand and the feel of the brakes themselves is quite solid and progressive. The wishy-washiness of the throttle didn't make sense until I was building some seriously extralegal speed through a series of shallow, lazy esses topped with questionably-level pavement. Aggressive inputs simply wouldn't upset the car. And the couple of times it did break loose, it was shockingly simple to catch. Parents, if your kids harbor boy-racer fantasies, you could make worse choices, as one has to work very hard to get in trouble in the Veloster. Somewhere alongside the mighty Columbia, my co-driver and I stopped to check out the 1.6L engine. Noticing the shiny aluminum cam cover, we decided to yank the plastic engine cover to get a closer look and found the shroud's underside festooned with a foam pad thick enough to absorb a punch from Sonny Liston. Chucking it in the trunk, we found the additional noise welcome. With the prevalence of direct-injection, automakers feel the need to hide the typewriter-clack of the injectors, leading to cancellation of the noises that actually make it easier to drive. You know, like the sound of the mill itself. Perhaps Hyundai's attempting to prepare us for the future of silent, electric motoring, but the Veloster's eerie silence serves to further disconnect the driver from the task at hand. Meanwhile, the optional Dimension audio system sounds excellent. In fact, the whole interior shames cars that cost thousands — if not tens of thousands — more. Volkswagen and Nissan could learn a lot from the Koreans about the proper application of hard plastics. The whole dash is made up of a patterned, matte hard polymer that looks for all the world as if it's made from something far more expensive. The seats are supportive and comfortable for all-day touring, and the rear seat, while not spacious, could contain a full-size adult for an hour or so with no complaints, though rear-seat passengers over six feet could find their heads meeting the rear hatch's glass in a rather unpleasant manner. The one glaring miscalculation in the interior is that if one's iPod is left plugged in when the car's shut down, upon restart, the iPod defaults to the first song in one's library. I love Rocket From the Crypt's "A+ In Arson Class" as much as the next ‘90s-era punker dude, but I don't want to hear it every time I start my car, thank you. But the Veloster's not for ‘90s-era punker dudes. Hyundai's aiming at their kids or their spiritual descendants. As somebody who walks through SF's Mission District and kind of bums out on the scene, I'm not quite sure how I feel about how my kids turned out. I dig the Veloster's styling and love that Hyundai took a chance with the bizarro three-door layout. The interior design shames everything else in the segment, even if the center stack resembles a cybernetic quoniam. Which, depending on your point of view, might not be a bad thing. The pricing starting at $17,300 (plus $760 destination) is spot-on for the segment, undercutting the car's Japanese analogue, the Scion tC, by $1,245. Plus, the Veloster seems more gender-neutral than the chick-car-rep Scion. The ride quality's excellent and the whole package has a soundness of build and a presence that bespeaks of genuine value-for-money. In short, the Veloster's a good car; why am I simultaneously impressed by it while remaining lukewarm? 2011 Scion tC: The GT-R’s "Mini Me"
Hyundai put us up at the Jupiter Hotel, an old motel that's been repurposed into a hipster haven, complete with its own venue, the Doug Fir. The new bands at the Doug, however competent, just weren't doing it for me, no matter how bananas the crowd was going. I was beginning to think I was just too old; too jaded. After wringing out the Veloster in the Gorge, Jalopnik-commenter-turned autojournalist Alex Kierstein and I were strolling around downtown Portland when we noticed the crowd inside the Dr. Martens store. When we got to the door, "Where Have All The Rude Boys Gone" was wafting out through the glass. We walked in and watched Ted Leo finish off his solo set. Even the new songs were fresh; still vital. Afterward, we chatted with him for a bit about his ‘67 Alfa Romeo Berlina. It makes me wonder what sort of musical hero will be keeping a Veloster on the road in 44 years. And if I'll want to hear said person's music at all. But in the grand scheme of things, does that matter? The kids in Portland seemed to be having a fine time with their codified and polished sounds, and Hyundai's gonna sell the snot out of this car. Who knows? Its more adventurous buyers might even pull the engine cover.